The physical vase was not there in the Forbidden City. It is presently on display in the Olympic Museum in Lausanne, Switzerland. It was presented to the big wigs at IOC back in 2004. Granted that it was just a picture on the wall but somehow it just caught my eye. 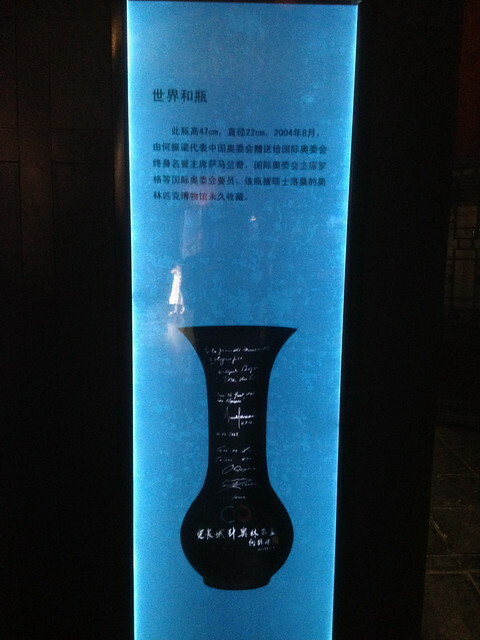 The name of the vase is 世界和瓶 which literally translate to World Harmony Vase. It is also a pun play on 世界和平 (World Peace). Very apt since the Olympic Spirit centers around the philosophy of world peace and harmony.